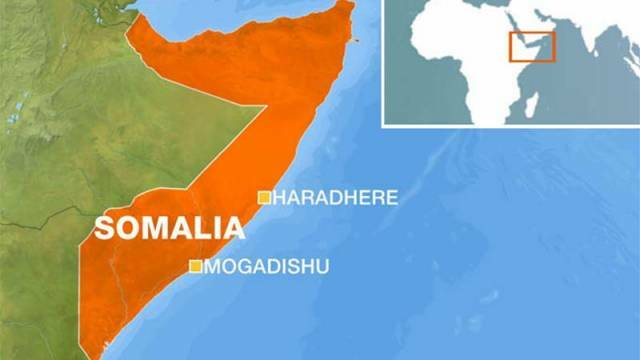 At least six al-Shabab fighters have been killed in two air strikes launched against targets near Haradere town in Somalia’s Galmudug state, the US military said on Thursday. A weapons cache was destroyed in a second air strike on Wednesday, it said, as part of the US’ operations in Somalia since last year after President Donald Trump loosened the rules of engagement. The US announced the latest deadly air strikes against the al-Qaeda-linked fighters, who control large parts of the country. It has conducted more than two dozen such airstrikes in 2018. The US has now carried out 35 air strikes this year against al-Shabab, Africa’s deadliest armed group. Two air strikes on Monday killed 37 fighters and one on Tuesday killed seven.